Content strategy tends to be either overcomplicated or vague. And often both. There's plenty of ways to approach it, but here's a simple template that can be repurposed over and over again. Blog posts are often not strong enough to survive on their own. But if they are grouped (and linked) together strategically, they can thrive. Unless you're aiming to become a real editorial publication, it's going to be really hard to gain traction with an ongoing series of standalone posts. Some businesses can pull this off, but they tend to be well-staffed and well-funded. Intercom — with more $100 million in funding and a veteran editorial team — is an example of a company doing this well. If you aren't a newsroom, here's another strategy that can work. In my post on big wins for content marketing, I explained how site structure is really important for SEO. Most blogs don't really take this into consideration. They might tag posts with a category, but they don't strategically plan content and linking around keywords they want to rank for. The Hub and Spoke strategy is designed to address site structure as well as topic idea generation (a pain point for many blogs), the editorial calendar and email list growth. Choose one short-tail keyword per hub. One keyword is plenty if there's sufficient search volume. Think of your Hub as "landing content" -- it's a landing page/table of contents/ultimate guide hybrid. It's designed for two purposes: 1) discovery and 2) navigation. A Hub page can include links to a variety of content, internal and external links, ebooks, newsletters, etc. It must be comprehensive. It must be bookmark-able. There is no better single resource on the topic than your Hub. Copyblogger has done this for email marketing and Help Scout did it for customer acquisition. Notice the breadth and the depth. A table of contents is a guide. You don't read the table of contents, you reference it. If you could install Google Analytics in your high school biology textbook, it would likely tell you that the table of contents has a really low bounce rate. People reference it, then "click through" to the chapter they need. It works the same way in content marketing. The Hub is your table of contents. It's a central place where all related content flows to and from. It helps people discover and navigate a topic. A low bounce rate is key to making this strategy work, as it's an important signal to search engines that people are moving deeper into your site once they discover the page. Once published, write a series of related posts (Spokes) that dive deeper into related ideas mentioned in the Hub. These posts should all link back to the main post with a mix of targeted, short- and long-tail anchor text. The Hub should be updated anytime a new Spoke post is published. Use Spoke posts to flesh out your editorial calendar. And don't be afraid to publish a few consecutive posts on related topics. Content marketers tend to resist this because they want to believe that all their readers come back every week. If you aren't truly a publication, let go of the idea and focus on the content that can bring compounding growth. Depending on how competitive your keyword is, you can write a Hub, then five Spokes, and repeat. For more competitive keywords, expect to do more Spokes all the while updating your Hub to reflect the changes. Your measuring stick is new traffic to the Hub page. Spokes may bring in new traffic too, but the Hub should become the default discovery page for organic searchers. Spokes provide breadth and make the Hub more valuable over time. Think evergreen. Think long-term. Think strategically. Company, followed by target keyword. Have a good example? Tweet it to me so I can add it here. 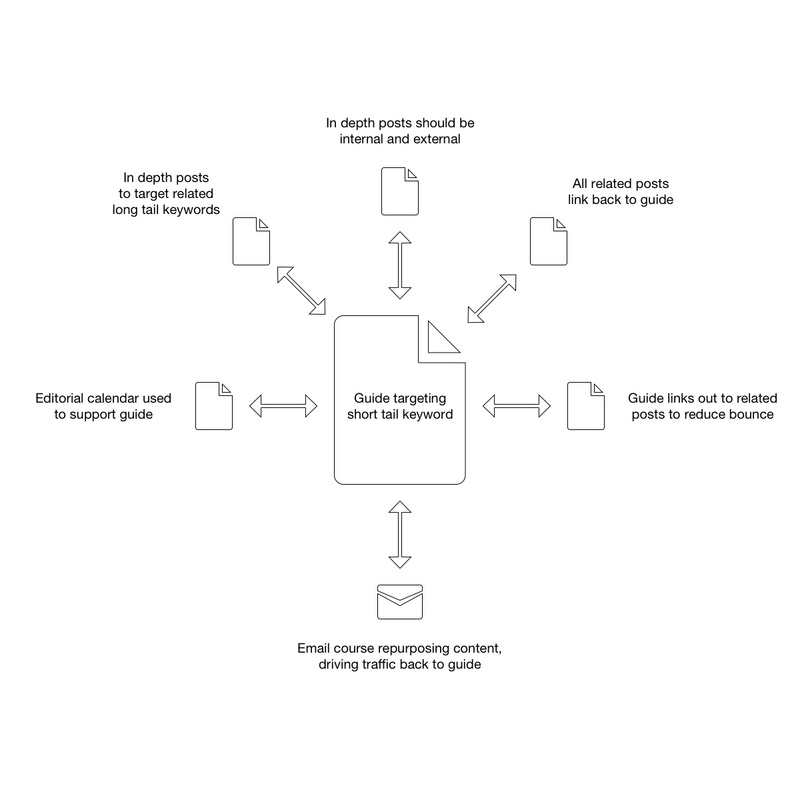 Need a good way to organize your internal linking? Check out this Airtable template.